To benefit from Fluxiom’s powerful storage, sharing and collaboration features, the first thing you’ll need to do is upload files to your account. The easiest way to do so is to add via the web interface. There are also other ways to get data into your Fluxiom account you will find at the very end of this post. 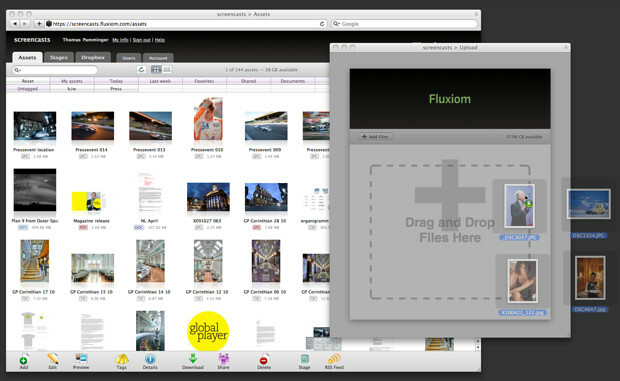 To add files simply click on the “Add” button at the bottom left in the Fluxiom toolbar. A window will pop up, allowing you to select files on your hard drive, using your operating system’s native file selection dialogue. 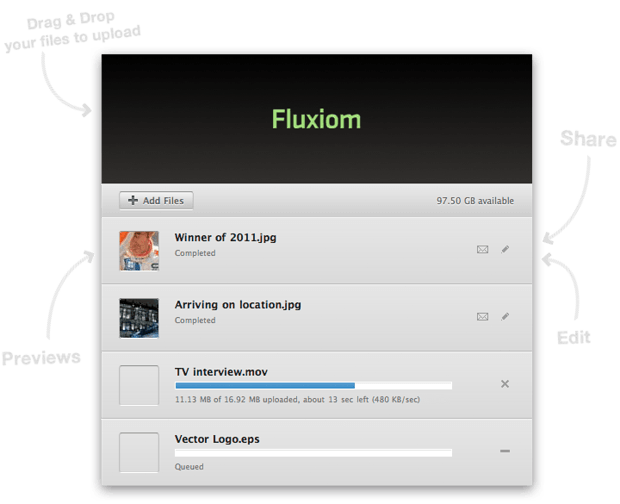 Once you selected files Fluxiom will immediately start the upload. You can continue to add additional files while the upload is in progress. If you are using a modern browser like Firefox or Chrome you can just drag and drop your files onto the upload window or onto the main asset window. In both cases the whole upload window acts as a large drop target for immediate and fluid action. Smart shortcuts right in the uploads list let you immediately take action on your uploaded files and preview, share or edit them. Those actions can also be done anytime in the main window. As an alternative to the web interface we also offer a free desktop tool. Fluxiom Uploader available for Windows and Mac allows you to upload files or complete folders with drag and drop ease right from your desktop. Your Fluxiom Inbox is a great way to fully replace traditional FTP servers. It allows basically anyone who knows the URL address of your Fluxiom Inbox to upload files directly into your Fluxiom account. This is ideal for receiving large files without cluttering your mailbox. Learn more about the Fluxiom Inbox.